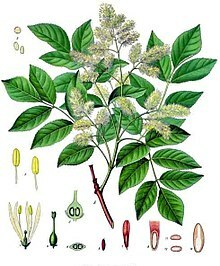 Fraxinus (/fraksɨnəs/) is a genus o flouerin plants in the olive an lilac faimily, Oleaceae. It contains 45–65 speshies o uisually medium tae lairge trees, maistly deciduous though a few subtropical speshies is evergreen. The leafs is opposite (rarely in whorls o three), an maistly pinnately compound, simple in a few speshies. The seeds, popularly kent as keys or helicopter seeds, is a kin o fruit kent as a samara. Rowans or Muntain Eshes is unrelatit tae true eshes an belang the Genus Sorbus though the leafs an buds is superfeicially seimilar. 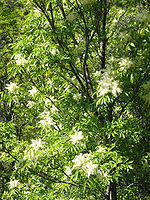 ↑ "Fraxinus L". Germplasm Resources Information Network. United States Department of Agriculture. 2006-04-03. Retrieved 2010-02-22. ↑ "Species Records of Fraxinus". Germplasm Resources Information Network. United States Department of Agriculture. Retrieved 2010-02-22. ↑ "Fraxinus L". ITIS Standard Reports. Integrated Taxonomic Information System. Retrieved 2010-02-22. Philips, Roger (1979). Trees of North America and Europe: A Guide to Field Identification, Revised and Updated. New York: Random House. ISBN 0-394-50259-0. OCLC 4036251. 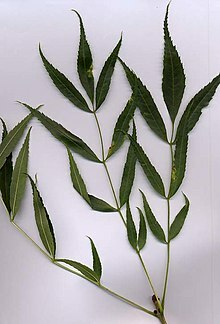 Wikimedia Commons haes media relatit tae Fraxinus. This page wis last eeditit on 15 Apryle 2017, at 22:45.